The DH50 series is the latest generation of high performance DC/DC converters setting a new standard concerning power density. 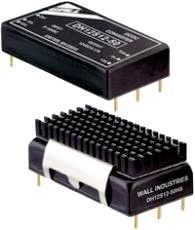 These converters offer 50 Watts of continuous output power in a 2.0” x 1.0” x 0.43” encapsulated, shielded metal package. All models have a 2:1 wide input voltage range and a precisely regulated single output. 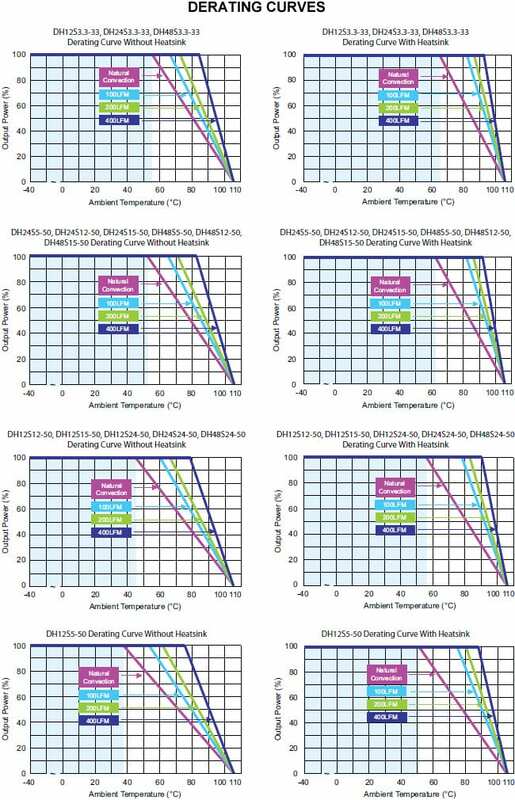 Advanced circuit topology provides a very high efficiency up to 92% and an operating temperature range of -40°C to +80°C. Further features include remote on/off, trimmable output voltage, under voltage lockout as well as over load, over voltage, short circuit, and over temperature protection. These converters are RoHS compliant and are ideal for use in battery operated equipment, instrumentation, distributed power architectures in communication and industrial electronics and many other space critical applications. Dimensions: 2.00" x 1.00" x 0.43"
Notes: 1. Transient recovery time is measured to within 1% error band for a step change in output load from 75% to 100%. 2. We recommend protecting the converter by a slow blow fuse in the input supply line. 3. The DH50 series can meet EN55022 Class A with external capacitors in parallel with the input pins. 5. Do not exceed maximum power specifications when adjusting the output voltage. 6. To order the converter with a heatsink, please add the suffix “HS” to the model number. (Ex: DH12S12-50HS). Due to advances in technology, specifications subject to change without notice. Request information for from Wall Industries. Wall Industries, Inc. offers fully custom power design capabilities. Our team of electrical and mechanical power design engineers will utilize proven design topologies and concepts to create a solution to your power requirements. If you don’t have a specification, Wall’s engineering team will assist you in determining what your requirements are and how best to provide a solution. Copyright © Wall Industries, Inc. All rights reserved.